Mental toughness is hugely important for all Crossfitters, athletes and for life in general. It can allow people to endure hard times and tough workouts in order to strive to become better, fitter, stronger and more resilient individuals. When it comes to mental toughness, many people think of long gruelling workouts that never end, involving many different objects and exercises, but there are numerous different ways to develop mental toughness. For example, Nordic skiing is world renowned for being mentally tough, physically demanding and building great muscular strength, cardiovascular fitness and a strong core. 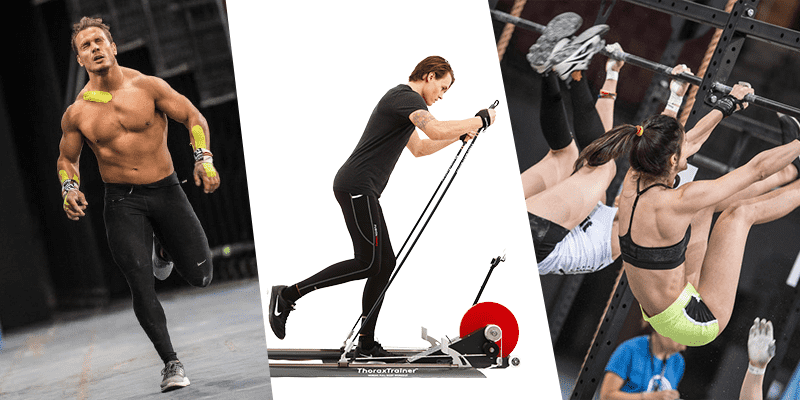 At the Oresund Games, they used the ThoraxTrainer, a realistic and highly developed Skiing machine to push the athletes to their limits during the workouts. 10 x 1 minute intervals with 30 sec break. Complete 1 – 10 then go back down to 1. The entire workout will take 30 minutes. Double poling with jump from leg to leg for each stroke. WHAT EXACTLY IS MENTAL TOUGHNESS AND THE PRINCIPLES BEHIND TRAINING IT? Mental toughness is often thought of as a character trait, a kind of grit that enables an athlete to do anything that they put their mind to. It is a form of resolve, a determination that no matter the odds or the setbacks, that person will achieve what they have set out to achieve. In Scandinavia, the Finns have their own word for this concept, “SISU”. SISU has no direct translation into English, but roughly means stoic determination, to have guts, and to have a commitment to a long-term goal. It also means to go beyond one’s mental or physical capacity. From this we can determine 3 things that are essential if we are to practically train and develop mental toughness. The first step to consciously improving mental toughness is to have a goal. Hardship is easier to bear when you know exactly what you are doing it for. In order to reach that goal, you must continue moving towards it whatever happens. This requires dedication. When you commit, it’s easier to block weaknesses and distractions out of your head. Pain is a distraction. This is your ability to take whatever is thrown your way and deal with it without letting it impact your performance in any negative way. Become a mentally stronger athlete! One of the best ways to train mental toughness is to use exercises that don’t place a huge physical strain on the body in a way that could lead to injury. Often the simpler the better. Think about sand bag carries or hill sprints with a weighted vest. You will never reach a point of technical failure with these exercises due to fatigue. This means you can easily program them into workouts that focus primarily on mental strength. The 1000 burpee challenge is an excellent example of this. It is simply 1000 burpees for time. There is very little technical skill involved in a burpee, so it simply becomes a mental battle to complete the 1000 reps. It is as difficult as it sounds. Rowing and cross country skiing are also excellent exercises for improving mental toughness for Crossfitters. Cross country skiing especially is renowned for being hard and requiring great skill, endurance and mental toughness. Many of its practitioners have some of the highest recorded V02 Max readings of any athletes of any sport. The ThoraxTrainer provides over 50 different exercises, and has appeared in many Throwdowns and Competitions. 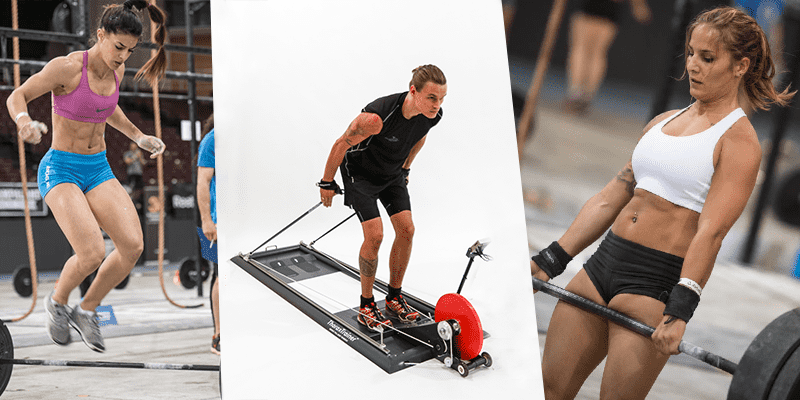 Here is a workout that you can try from this competition involving the ThoraxTrainer. 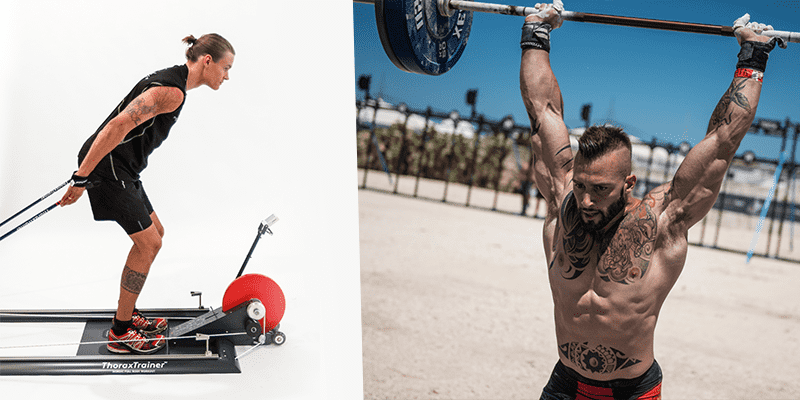 With a workout like this you can see how this new element has been brought into the metcon and understand how each athlete’s mental toughness, physical fitness and capacity for endurance was tested as a result. Mental toughness is more traditionally thought to be developed through longer, gruelling workouts, and these work, however as another important aspect of your fitness it can also be trained in shorter and intense workouts as well. This is a max effort workout. 100% burn out. 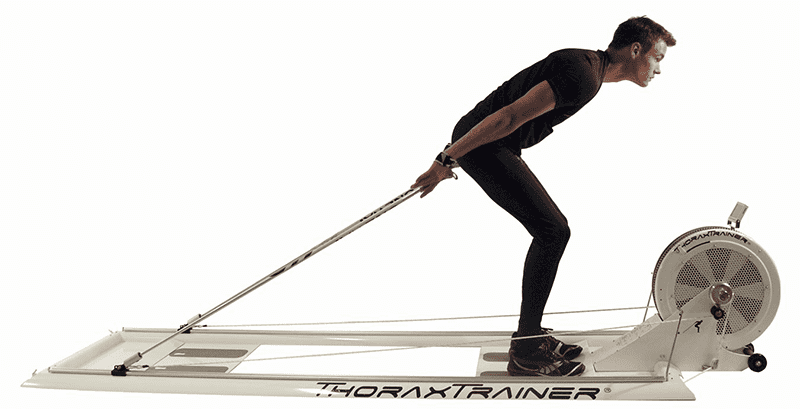 Firstly ski 600 metres as fast as possible on The ThoraxTrainer and record your time. Ski as far as you can using the recorded score as a time cap. This is a short workout, but it requires the ability to continue pushing despite the pain. There is a simple, clear goal, and it is a great way to develop mental toughness using the ThoraxTrainer. Body language and behaviour has a strong psychological effect on mental toughness. Making a conscious effort to adopt positive body language and act like this during a workout can become a habit over time that will have strong effects on your workouts. During a workout, stay close to the equipment you are working with. have a rest, then get back at it. To turn your back and walk away is a defeated posture. This idea is very primal, but the whole idea of mental toughness goes deep into the human psyche, so let’s delve. The Scandinavian athlete Mikko Salo will, on principle, will never lie on his back after a workout, no matter how completely exhausted he is. He does this because animals lie on their back when defeated. He maintains that it signifies a weak position and that in order for him to stay as strong and as mentally tough as possible, he should always maintain powerful body language. Imagery is the psychological process of mentally rehearsing the future in the way that you want it to go. This could relate to performing well in a workout, a competition, or in a larger life plan. The ability to see success in your life helps you to believe that you are capable of success. In terms of mental toughness, this links with being focused on your goals and having the commitment and resilience to see them through. This takes mental strength. Try this in your next workout. Once you see what’s written up on the whiteboard, imagine yourself performing each exercise well, working hard and finishing strong. This will mentally prime your mind for success. A key part of mental toughness is the ability to be able to see things from your own perspective. Break the task ahead into smaller manageable chunks. For example, say you have a set of 100 wall balls or 50 pull ups ahead of you. You know this will burn, so count in sets of 5 or 10 and break up the number. If things get especially bleak, concentrate on only the next rep. You can always do one more. Try using this tactic on the following workout. Mental strength can also be used to help you win competitions. When you compete, you should always focus on your own performance, so this advice is not for everyone, but you can use these methods to help you win. If you have a strong competitive streak, use that to power your own performance. If you see a competitor struggling, don’t break until they do, then make sure to do an extra rep, or two or five. These small psychological victories can chip away unconsciously at the confidence of other athletes, and help you to win. Train your mind for victory!